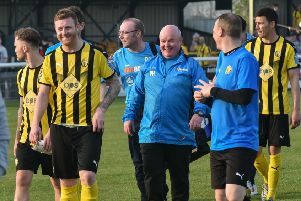 Leamington boss Paul Holleran blamed a lack of courage for his side’s inability to make the most of their extra man against Stratford. In front of a bumper crowd Boxing Day crowd of 805, Brakes already led 1-0 when Simeon Tulloch was shown a straight red in the closing stages of the first half. However, it was the visitors who took the game by the scruff of the neck in the second period, forcing Tony Breeden to make several high-quality saves before equalising through Kieren Westwood. And while Holleran was pleased with an encouraging opening from his side, he was powerless to explain the second-half transformation which cost them two points. “I thought first half the players dealt with the situation well,” said Holleran. “Boxing Day derbies always throw up lots of different equations. I thought we were dominant and maybe unfortunate not to come in more than one goal up. “The sending-off at the end of the first half, we spoke about trying to deal with that better, but sadly we didn’t. “We got too deep, our ball retention was as bad as it’s been; it was like watching a completely different team. “As good as we were first half, we were equally as bad in the second. You can’t take anything away from Stratford, they played it much better than us, and thoroughly deserved their point. “From our point of view, we needed to really make the pitch big, and to do that our players in certain areas of the pitch have got to be braver on the ball, move it quickly into those areas and make good decisions, but sadly in the second half we didn’t do that. Holleran also felt key absences were a mitigating factor, with unavailability through injuries and suspension leaving them short of much-needed know-how and game management. “Obviously not having players the calibre of Jamie Hood, Darren Pond and Callum Gittings available to us today has hurt us,” he said. “The experience and craft of these players was sadly missing. “It’s another point on the board, though. Tony Breeden should be fit to face Banbury despite overstretching his medial collateral ligament against Stratford, while Callum Gittings returns after suspension. Jamie Hood is not expected to be back until February after a scan showed a hairline fracture at the top of his shin.